Biochemistry and Organic Compounds: A Complete Unit Plan Bundle. 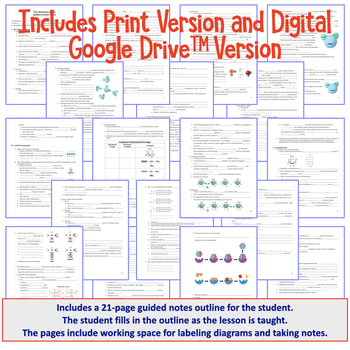 The bundle includes a teaching PowerPoint, notes, labs, fun review games, homework assignments, and so much more. 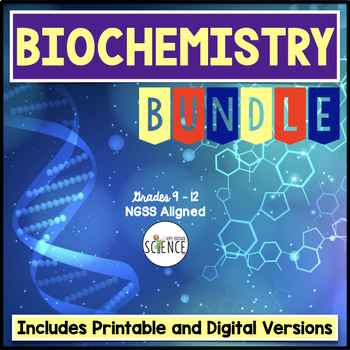 This bundle contains everything you need to teach this unit to your biology or life science students. Each of these products is sold separately in my TpT store, but buying the entire unit in one download will save you money. If each of these products were purchased separately, the total cost would be $41.23. The bundle sells for $30.99, a savings of 25%. 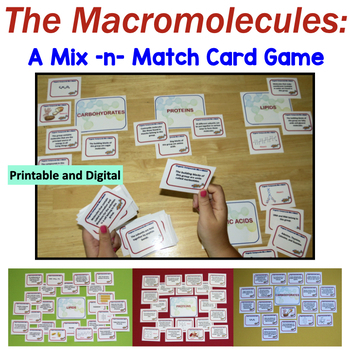 For Even Greater Savings: This complete unit bundle is included in my "Full Year Biology Curriculum Bundle." Click the link below to view this bundle. This bundled unit contains at least 2 weeks of materials depending on how many lab activities you want to do. If you do all the labs included, it will take 3 weeks. 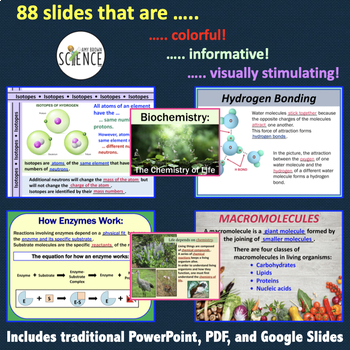 • Teacher Guide with tips, suggestions for sequencing, and NGSS alignment. When appropriate, I have included each product as an editable Word document, but I have also included each product in pdf form. • The Nature of Matter: Atoms, subatomic particles, elements, and compounds. • Water! Can’t Live Without It! The polarity of water, hydrogen bonding, cohesion, adhesion, mixtures, types of mixtures, solutions, solute, solvent, suspensions. • Reasons why life on Earth depends on water. • Acids, Bases, and pH: The pH scale, acids, bases, and buffers. • Carbon Compounds: Definition of organic compound, characteristics of carbon, macromolecules, the four groups of organic compounds. • Carbohydrates: How to recognize the structure of a carbohydrate, monomers of carbs, examples, main function of carbs in cells, monosaccharides, polysaccharides, starch, glycogen, cellulose. • Lipids: How to recognize the structure of a lipid, examples of lipids, characteristics of lipids, building blocks of lipids, functions of lipids in cells, saturated and unsaturated fats. • Nucleic Acids: How to recognize the structure, functions of nucleic acids in cells. • Proteins: How to recognize the structure of a protein, functions of proteins in cells, building blocks of proteins.